At Governor Patrick’s press conference today at the New England Aquarium, he announced Climate Change Preparedness Initiatives funded by a $50 million state investment. 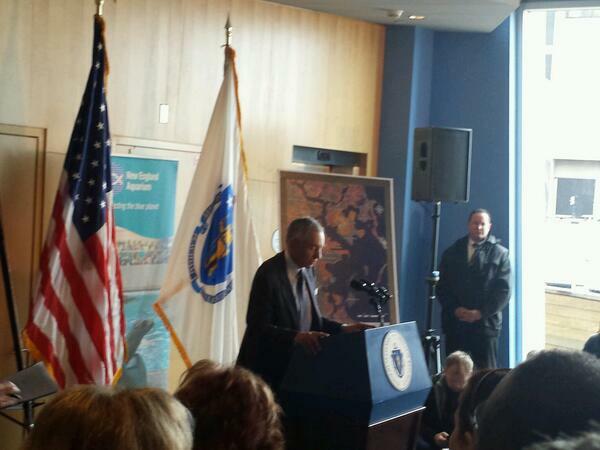 Following Mayor Marty Walsh and Secretary Rick Sullivan, I spoke at the event representing the business community. Climate change can have significant impacts affecting the overall economy; directly, by damaging structures, and indirectly, by compromising transportation systems, communications, and utilities. There is no question that an increasing number of extreme weather events combined with future sea level rise require local and state agencies, building owners, lenders, insurance underwriters, and tenants to consider how to prepare for and respond to such events. The business community believes that preparing for storm related events should be a shared responsibility between the public and private sectors. A primary role for city and state governments should be to ensure the continuity and protection of public infrastructure and public safety. Stakeholders should be at the table with state and local decision makers early on in the process to prioritize short-term and long-term public and private responses. The business community, and the community at large, need to have a clear understanding of the government’s responsibilities for infrastructure and critical services. Especially with New York City’s experience with Hurricane Sandy, we feel that Best Management Practices developed in other cities should be shared among public and private sector stakeholders, and their applicability to the Commonwealth should be carefully considered. Finally, both costs and risks need to be evaluated when the public and private sectors consider climate change-related investments and improvement. With scarce resources, there will need to be a balance of adequate planning and a risk-based, cost-benefit analysis in order that funds are prudently expended. Along with other business groups, we look forward to a true collaboration with state and local governments to safeguard all our valued resources. This entry was posted in Environment, NAIOP Government Affairs, Transportation & Infrastructure and tagged climate change preparedness, Governor Patrick, public private partnership by Tamara Small. Bookmark the permalink.